Story: Renowned horror novelist Mike Enslin (Cusack) only believes what he can see with his own two eyes. After a string of bestsellers discrediting paranormal events in the most infamous haunted houses and graveyards around the world, he scoffs at the concept of an afterlife. Enslin's phantom-free run of long and lonely nights is about to change forever when he checks into suite 1408 of the notorious Dolphin Hotel for his latest project, "Ten Nights in Haunted Hotel Rooms." 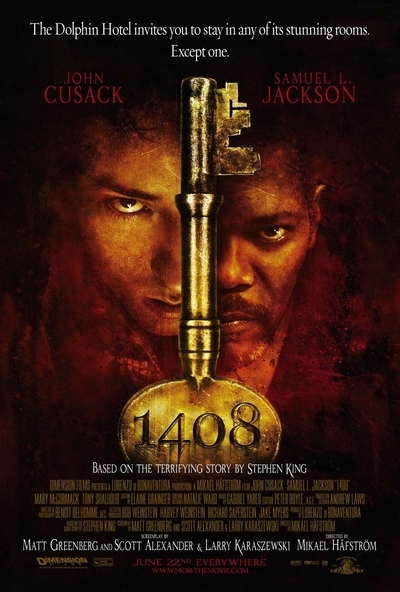 Defying the warnings of the hotel manager (Jackson), the author is the first person in years to stay in the reputedly haunted room. Another bestseller may be iminent, but like all Stephen King heroes, Enslin must go from skeptic to true believer - and ultimately survive the night.